For every single person who completes one of Ride25’s cycling tours, Ride25 will donate £20 to Re~Cycle to get a bike to Africa. Research has shown that each bike donated by Re~Cycle is used by an average of six people in Africa, usually family members. So every bike Re~Cycle provides can transform six people’s lives. Across the UK, millions of bikes are thrown away or left to rust in sheds, whilst millions of people in Africa have to walk for hours each day, often carrying heavy loads. 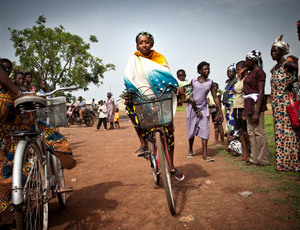 Re~Cycle rescues unwanted bicycles across the UK and sends them to projects run by partner organisations in Africa. There, bikes offer a simple, affordable transport option, generate income opportunities, and save time and energy. With a little maintenance a bike can benefit a family for many years. You can join the Re~Cycle team taking part in Ride25’s challenge ride from Geneva to Milan. Every day many African children have to walk a 20 mile round trip to school, leaving them exhausted and unable to concentrate. 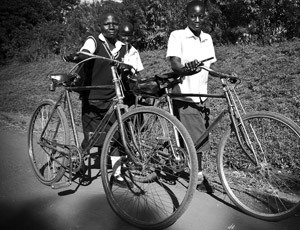 Bikes allow them to get to school in a fraction of the time which helps to improve their learning. Between working and looking after their families, the average woman in Africa walks for four hours a day. Whilst walking they can also be subject to harassment. 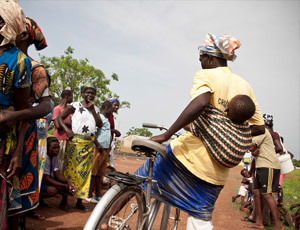 Bicycles allow women to go about their jobs much quicker and more safely and also help them to carry out other tasks such as growing a vegetable patch or taking their goods to market. In most rural African communities, women use headloading to carry wood and water. This puts significant strain on their necks and can cause long-term damage to their backs. Bicycles can be easily adapted to carry heavy goods and can also be used to transport Aids workers coping with the HIV/AIDs epidemic. All bikes need to be serviced and require parts. A bike project such as this offers people the opportunity to learn new skills, get jobs and earn money, which in turn helps the local economy as a whole. Communities that are productive are far less likely to be affected by conflict or famine. Since it was founded in 1998, Re~Cycle has sent a total of 47,000 bikes and thousands of spare bike parts to 15 different countries. It is thought that each bike can be shared by up to six people and so Re~Cycle have so far enabled 250,000 people access to transport. Pretty amazing stuff. 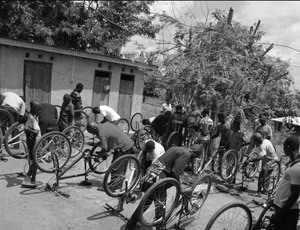 As well as this, in Africa many jobs have been created through bike projects and workshops, with hundreds of men and women training as bike mechanics. Bikes are donated to Re~Cycle by people all across the UK who have a bike they no longer need and want it to go to a good home. The charity relies on volunteers to collect and prepare bikes and load the containers before they are shipped to their new homes.